When I first got wind of this concert series happening in the New Zealand summer, I instinctively knew that attending would be a foregone conclusion. The chance to see these three iconic artists live in person was a golden opportunity that any 'classic rock' fan could not ignore. Yep, quite happily, I absolutely categorize myself as that kinda person. Hey, you can't deny the music you grew up with still resonating loudly all these years later! Don't get me wrong, I'm a huge music fan who loves discovering new & exciting artists and their unique musical gifts these choose to bestow for our listening pleasure. Still, when I hear certain classic songs, I am transported back to when I first heard them - all those years ago. Once embedded firmly into your memory bank, they are near impossible to remove! So, with this pleasure (and for the record - it's not a 'guilty' one either!) of attending being the foregone conclusion, I naturally shared the golden opportunity with my good friend Mike, who of course, said YES! Heh, I wasn't really going to get a different answer considering our mutual love of the same kinda music. "Once a Westie, always a Westie" - you know the drill people! The 3 acts are over here for a small tour - 5 dates across the breadth of the country in Mid February, stopping in some of our most scenic locations that New Zealand can offer. My stop was the small country town of Matakana, almost half way between Auckland and Whangarei. They are a covers band, specialising in blues rock amongst other similar genres. With a combined age of 300 amongst the core members, experience isn't in short supply! Although we all were there for the headliners, Latitude put on a great snappy little set, exuding confidence, charm and an abundance of musical talent. Both guitarists wouldn't have been outta place in the main bands either! Kudos guys for a job well done. SetList: Tin man; You can do Magic; Don't Cross the River; Daisy Jane; Riverside; I Need You; Here; Ventura Highway; Woodstock; Til I Hear It From You; The Border; Woman Tonight; Only In Your heart; California Dreamin'; Lonely People; Sandman; Sister Golden Hair. Encore: A Horse With No Name. For a band that has been together for a very long while (42 years! ), America were, for me a very pleasant surprise. 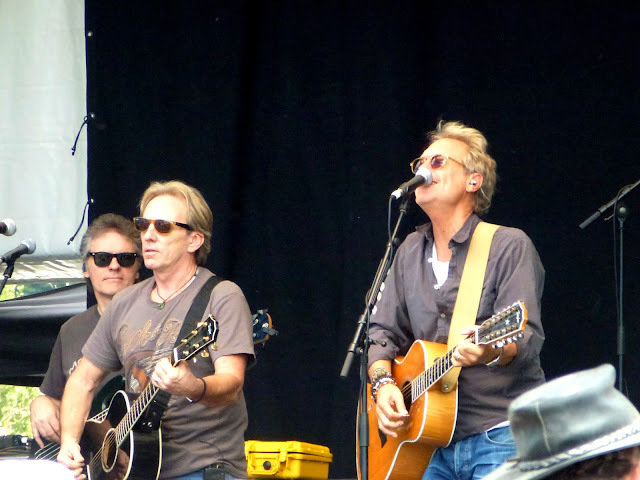 I knew that the main pair of Gerry Beckley & Dewey Bunnell are the main focus, but hot damn, the backing band was solid as! On guitar is Michael Woods (Woodsy), a mere 'pup' - he's only been in the band for... 36 years! Same for rock solid drummer Willie Leacox. But he's got another 5 years on him! Bassist Richard Campbell is the 'baby' - only being involved for the last 10 years. What they bring is an instinctive nose for their ability to make those revered classic songs come so ably to life, adding a meaty punch where necessary, turning things down when the song demanded more space and clarity. Dewy and Gerry's voices are as exactly as I remember them on recordings listened to many many times over the years. Their harmonies were damn near perfect, getting additional great support from the other two guitarists when needed from time to time. A personal set highlight was the stunningly intense "Sandman" - sounding huge and powerful, all four weighty guitars anchoring this fluid song with precision. You can see what the immense benefit from many years of touring does to certain songs. It allows a band to reinterpret a song to sound both current - and dynamic, not allowing any hint of staleness to creep in. With a touring schedule of over 100 gigs per year (for the last 39 years no less! ), America will continue to justifiably perform for a very long while indeed. America? I'd go and see 'em again. If you get the chance, then do so. You won't regret it! We're a Canadian Band, we come to your land... We're a Canadian Band! Out of the three acts today, these veteran Canadian rockers were the band I was looking forward to the most. Incredibly, they've never ever been to this part of the world before. 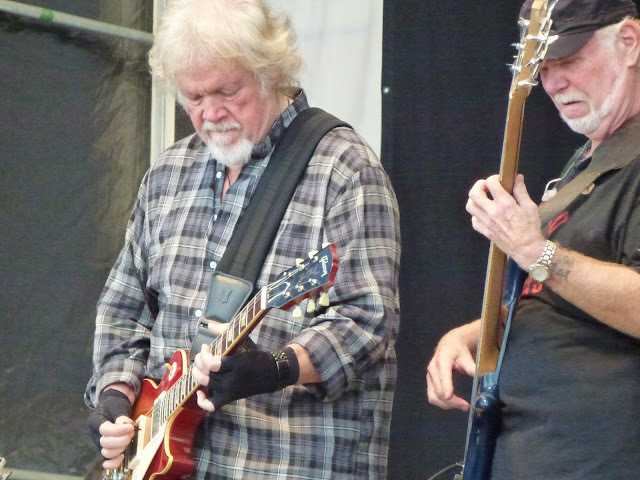 Midway through the set, Randy Bachman remarked that they thought that there weren't many BTO fans in this country. Randy, mate, we've always been massive fans of the groups you've been involved with. You guys coulda come down anytime during the 70's - and got a sold-out concert - with no effort whatsoever! I took upon myself to go into the mosh pit (Well, as much as you can 'mosh' when the average age is 50 plus!) and adore my musical hero's up close. Having waited, well a lifetime, then I wasn't going to be denied the golden gift that was handed to me. The chance to get as near as possible to these rock legends was an opportunity I eagerly accepted. Soo... was it worth it you ask? Hell and yeah!!! It was a fulfillment of one of my musical bucket list items. Check, and double check. My photos and video don't really do proper justice to what I witnessed today, watching these rugged road warriors blasting out their stupendous brand of high-octane Rock 'N Roll, clearly enjoying the appreciative Kiwi crowd who were just as enthusiastic as I was. Nice to be surrounded by like minded individuals who clearly have exceptional taste in their preference for 'classic rock' artists such as Bachman/Turner. Although, there is no "overdrive" in their current touring name, the band certainly displayed many examples of what you would call 'music in overdrive' throughout the well received set. My only complaint (of sorts - I'm being picky!) was that they performed the first four songs from side one of the album "Not Fragile", but didn't do track five, a stunning instrumental titled "Free Wheelin" which contains some amazing interplay between all 3 guitarists. The seventies shone with many moments of musical brilliance like this one. If you've never heard it before, then I strongly urge you to do so! Regardless of that minor detail, most bands would kill for a song list that included "Not Fragile", "Rock Is My Life", "Roll On Down The Highway" and "You Aint Seen Nothing Yet". Hell, who wouldn't? The "Not Fragile" album is absolutely in my all-time top 10 list of favorite Long-Players. Once heard, never forgotten. Another major highlight was Bassist Fred Turner's incredible voice. For a guy who is now 69 no less, how he can still sing the songs he does, is little short of unbelievable. Once described as having a voice that sounded like 'gin and tears', the gruff bellowing powerhouse tones Fred spurts out have to be heard in person. They don't make 'em much like him these days - mores the pity! And his bass playing is pretty damn awesome as well. Not 'frilly' in any sense, Fred just drives, natch motors the songs along. Much like a truck in overdrive in fact! If ever a band lived up to it's name, then Bachman-Turner Overdrive told you well in advance what the music would sound like. Couldn't mistake it for YES in any way, shape or form! What a blast, watching these master musicians up close, making sonic magic effortlessly - song after song. I'm so glad that Randy & Fred decided to reform back in 2009, touring solidly for the last 4 years, and finally coming to NZ! See you Randy, Fred & Co - further on down the road! Do you Patricia & Neil, promise not to keep us in the dark for another 30 odd years??? Setlist: All Fired Up, Invincible, So Sincere, Treat Me Right, Hell Is For Children, We Belong, Shadows of the Night, We Live for Love, Don't Walk Away, Promises in the Dark, Somebody's Baby, You Better Run, Little Too Late, Hit Me with Your Best Shot, Love Is a Battlefield. Encore: Everybody Lay Down, Heartbreaker/Ring of Fire. 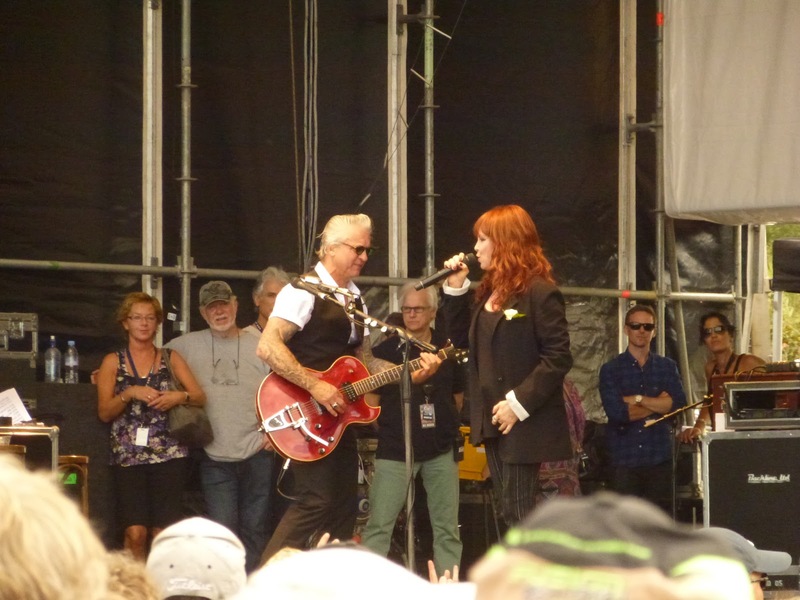 Like the previous two acts, Pat Benatar is also a first time visitor to New Zealand. Again, like the others, she was pleasantly surprised at the level of support here for her type of music. Gotta say it felt like the majority of people at this concert were here because of her presence. Well, it seemed like the ladies in attendance thought along those lines. The guys (me included) got our moneys worth with the preceding act. Having never toured here before, Benatar had a massive reservoir of goodwill aimed squarely in her direction. So, when she hit the stage for the first number we were all fired up indeed! And, save the slower, obligatory ballad-y numbers, Benatar & her tight band rocked hard - for the duration of the set. For a woman who is 59, man oh man, has she still got the ability to sing her lungs out! An incredible performer to witness live in concert, Benatar is the living embodiment of the archetypical 'rock chick'. 40 odd years of honing her inimitable stage craft means by the time she has got to this point in her career, performing in front of an audience comes both naturally and effortlessly. Well, that's how it appears to us anyways. I know for sure, she was working extremely hard, constantly moving from side to side. Benatar's Interactions with the both the audience - and her incredibly tight band - meant our eyes were firmly glued to the action centre stage. She definitely is in her element on stage, irrespective of her superb recorded achievements throughout her lengthy career. The setlist was both predictable, but very enjoyable at the same time. As with the previous two acts (And pretty much the overwhelming majority of contemporaries still performing today), you don't come all this way - and not play your hits. That would be more than counterproductive, that would spell for a miserable time inflicted on all but a few diehards who ache to hear obscure album tracks, forgotten b-sides and the like. I yelled out at Fred Turner for "Free Wheelin" a few times during Bachman/Turners set, all to the rather obvious no avail. Was I surprised? Course not. They and Benatar are not those kinda bands. They only have so much time allotted in the tight schedule, so safety first. Most of the crowd don't want obscurities, just play the damn hits - all of 'em! My two personal highlights were the revelations that Benatar has still got the goods - vocally, and her husband, guitarist extraordinaire, the supremely underrated Neil Giraldo. Might just have to rediscover Benatar's back catalogue to reassess his undoubted musical prowess, such was the impact of witnessing him in action. Phenomenally underrated by all but a few other musicians, Giraldo is a monster on the guitar, creating a signature style that blurs the line between rhythm and lead.